Ahmedabad : With only two days left before Gujarat votes in the first of two-phase elections, mysterious posters have appeared in the state asking the Muslim community to vote for the Congress, projecting Ahmed Patel as its chief ministerial face, which the party says is a mischievous bid to polarise voters. 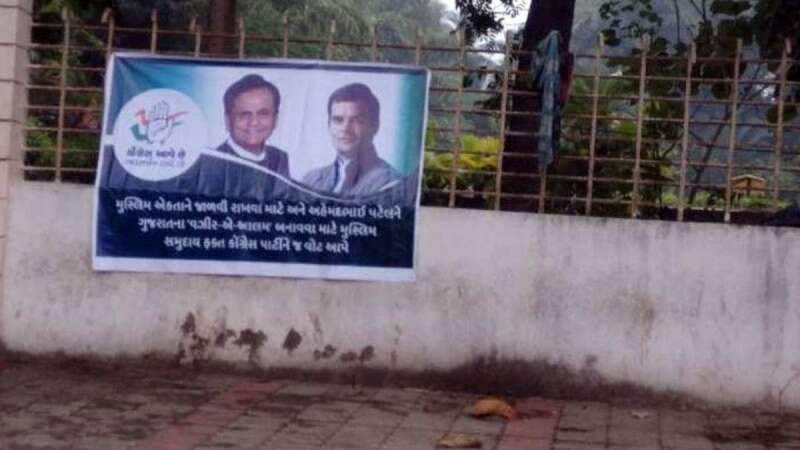 "To maintain unity within the Muslim community and to make Ahmed Patel the 'wazir-e-alam' (grand minister) of Gujarat, we request the Muslim community to vote only for the Congress," the poster said in Gujarati with Rahul Gandhi and Patel along with the party symbol of Hand. Blaming the BJP, Patel quickly rebutted the contents of the poster and said he was not a contender for the Chief Minister's post and would never be. "The moot issue is that the BJP is trying very, very hard to divert the narrative from its performance of last 22 years to a divisive agenda. Hence, their reliance on lies and propaganda. But people of Gujarat have made up their mind this time," Patel tweeted. "Putting up fake posters and orchestrating a rumour campaign shows the utter desperation of the BJP. Fearing defeat, do they have to rely on such dirty tricks? I have never ever been a candidate for the CM and will never, ever be." He said the "misinformation campaign by the BJP" showed that they know they were going to lose Gujarat elections. Gujarat is considered to be the BJP's Hindutva lab where other parties are chary of projecting Muslim issues.